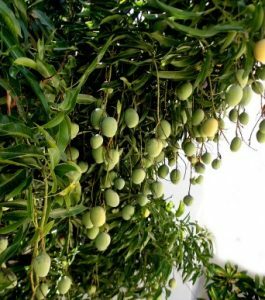 Mangifera indica is a large evergreen tree to 20 m tall with a dark green, umbrella-shaped crown. Trunk stout, 90 cm in diameter; bark brown, smoothish, with many thin fissures; thick, becoming darker, rough and scaly or furrowed; branchlets rather stout, pale green and hairless. Inner bark light brown and bitter. A whitish latex exudes from cut twigs and a resin from cuts in the trunk.